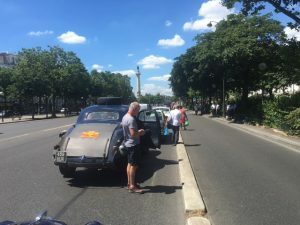 We line up at the holding point and when there is about 10 cars, and a suitable gap after the last group, we set off following a chequered flag waving roller skater into the melee of Parisian traffic. At most of the major junctions the roller skaters switch in a sort of relay race and we are waved along the correct route. We are hoping that the Paris traffic lights are not all fitted with cameras as we cross quite a few red lights to make sure that we keep up with the convoy. There is a certain invulnerable feeling as with headlights on and heavy tooting of the horn we head over the red lights and given the journey we have done makes it all right! 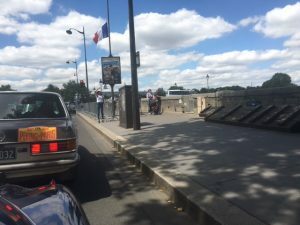 Not sure the gendarmes agree.